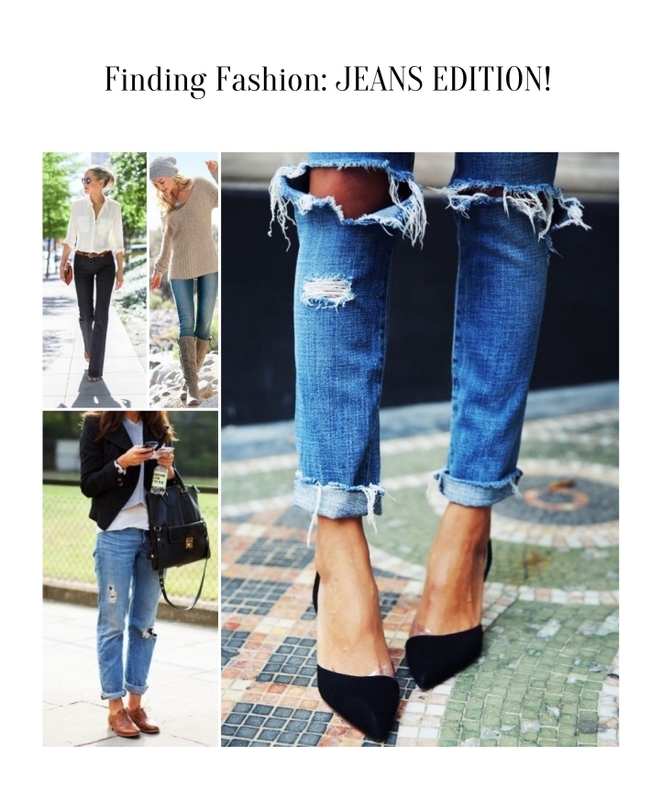 Since I haven’t done a Finding Fashion post in a while, I thought what better way to segue from summer to fall than with a jeans edition! Jeans are my absolute FAVORITE clothing staple. I wear them almost every day, especially when the weather gets cooler. No matter how you wear them- dark wash, sand blasted, flared, distressed, skinny, boyfriend cut, high waist, boot cut, etc… jeans almost always look great, and it really feels like there are endless possibilities and styles to choose from no matter what shape you are. Before I begin, I want to preface that this isn’t my usual Finding Fashion where I find an inspiration outfit, and then go and find you a similar outfit for a lower prices at the discount type of stores. I’d like to venture into a possible “fashion faux pas”, and suggest (for the sake of a Finding Fashion challenge) that you step out of your comfort zone of mall and box store shopping and try searching through the racks of consignment shops, thrift stores, antique stores as well places like Salvation Army & Goodwill for your next pair of jeans. Yes, you read that right, and NO I am totally NOT joking with you. During my years as a costume designer for a small community theater I became a pretty savvy shopper and could scour vintage, thrift, antique, consignment, and second hand stores for unique, one of a kind costume pieces, as well as modern outfits and accessories since the theater I worked for offered me very small budgets to costume their productions. I got really great at spotting a valuable clothing item for a great deal. Every so often I would come across a fabulous article of clothing for me as well! (Hey! You gotta keep the shopping fun!) Most of the time I thrift store shop, I search for a great pair of jeans. 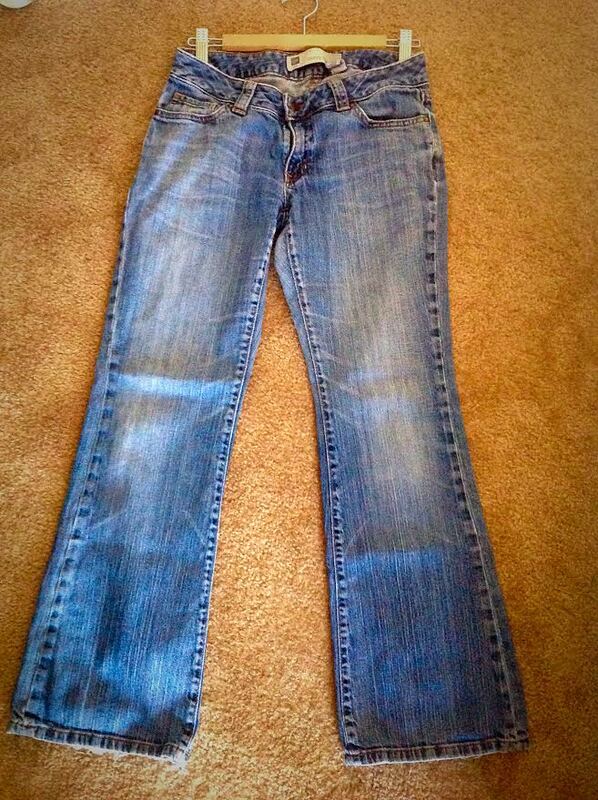 In all of my years of shopping, my most favorite pairs of jeans have been the ones that I have “thrifted”. I have learned that not only are they amazingly priced, they are always worn in and comfortable, and I am never worried that they will shrink in the wash because I know they have already been through a washing machine at least once or twice. So the way they fit in the store is how they are going to stay! Surprisingly, I always get the most compliments on my thrift store finds! My favorite jeans (Gap)- I found them at a thrift store for only $4! If you are still not convinced, and keep thinking to yourself “uhhhh yuck!”, I’d like to offer another benefit of thrift store shopping for jeans- you can find DESIGNER jeans at a fraction of the cost. During my shopping excursions, I personally have come across the brands Hudson, 7 For All Mankind, J. Crew, Baby Phat, DKNY, Express, Gap, Guess, and Levis just to name a few. Of course there are piles of Target, WalMart, and miscellaneous brands of jeans there as well, but you never know, maybe you will find a new favorite brand. There have even been a few times that I have come across a brand new pair of jeans with their original tags still on, but for me those instances have been very few and far between. Additionally, if you feel like doing your own jean distressing or altering, it hurts a little less knowing that the jeans you buy from a thrift store were only a few dollars as opposed to the stores full prices. I still love shopping at main stream stores, (and will continue to do so) but I hope that this inspires you to expand your shopping repertoire and venture into a consignment shop or thrift store and spend some time looking through the racks. You never know, you just may find yourself a special gem! Advocating a trip to the thrift store to go shopping for jeans is nothing new for me, but it may be a new idea for you. If shopping at a thrift store is a new venture for you, and you are still on the fence about it, you may be more convinced by what Empowered Dollar says about consignment shopping. Also visit treehugger.com to see what they have to say. You can also check out the article- Embracing the Thrift-Store Ethic: 18 Top Tips For Buying Used Clothes.